Take the guesswork out of sewing and learn professional techniques making 3 skill-building projects from the book, School of Sewing, by Shea Henderson. Make a simple pillow with a zip back, a lined, customizable tote bag and a sophisticated chefs' apron for yourself or as a gift! 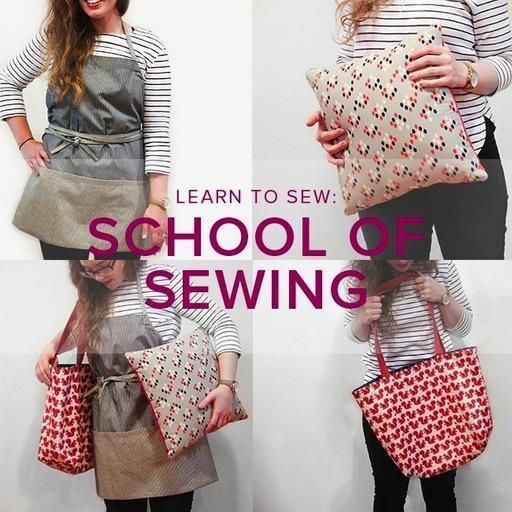 This class is perfect for first-time sewists and for beginners who want to gain confidence using our BERNINA sewing machines. There may be homework between classes. Students are welcome to use our open sewing studio (when available) to work on class projects. Sew Basic class is suggested prior to taking this class. Please purchase supplies in advance of your class. If you plan to shop for supplies the day of your class we recommend arriving at least 45 minutes early. 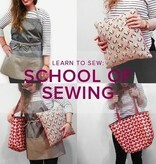 What is a “Learn to Sew” Class at Modern Domestic? You have never touched a sewing machine before or it has been years since you have. You know very little to nothing about sewing but you are eager to get started.